Das Keyboard, a Perfect Gift for Geeks? "For those who aren't familiar, a partition is nothing more than one smaller piece of a larger hard drive. Though this is oversimplifying things a bit, to the operating system there's no difference between a hard drive and one partition of a hard drive - both appear as distinct mountable volumes to the system. "And since a partition looks and acts like a hard drive, when you have an issue with a partition, the problem is usually restricted to that one partition - the remainder of the partitions on that disk will be fine. This isn't true in all situations, of course. If you have a catastrophic failure of the drive (the power unit fails, the read/write heads stop moving, etc. ), then partitioning isn't going to help at all. But for most minor drive problems, only the affected partition will have difficulties. In my case, even though the iPhoto partition was completely thrashed, I could read and write to the other partitions on the disk without any troubles at all...."
PR: Trans International has announced the worldwide availability of 2 GB memory module for newly released Apple iMac G5 1.9 GHz, 2.1 GHz and Power Mac G5 2.0,2.3, 2.5 GHz machines. Trans is a member of the Apple Developer Group and a leading memory module manufacturer since 1988. Trans is now shipping 512 MB and 1 GB modules and 2 GB will be available in second week of November 2005. Trans memory modules conform to Apple's stringent electrical and mechanical design guidelines. The unbuffered DDR2 PC2-4200 Memory Modules support data rate up to 533 MHz. PR: EDGE Tech Corp, a leading supplier of DRAM and flash memory upgrades, portable computing products, storage devices, and other personal technology solutions, is pleased to announce its DDR2 and DDR2 with ECC memory for the Apple series of computers. EDGE Tech Corp's DDR2 memory modules are the industry's only Mac memory modules to undergo the rigorous testing and vetting process necessary to ensure lightning speeds and ultra stability to the Mac user's experience. Manufactured to the needs of the power user, EDGE Tech's memory modules will be available in memory configurations from 512 MB to 4 GB of DDR2 RAM and DDR2 with ECC and will be available to consumers immediately. EDGE Tech qualifies all DDR2 modules by thoroughly testing them under a variety of environmental conditions such as extreme heat and bitter cold while performing under load with the latest Mac software. EDGE Tech's modules are designed under compliance with the industry's JEDEC semiconductor engineering standard and assembled in ISO-compliant conditions while tested with the lowest possible latencies and highest bus speeds. EDGE products are available through resellers including CDW, Insight, PC Connection, PC Mall, Zones, eCOST, Tech Depot (an Office Depot Company), Walmart, and Staples.com, and through distribution at Tech Data, Ingram Micro and D & H Distributing. This specific EDGE product is also available for purchase through the company's website. Apple iMac G5 users can now connect to wireless networks that were previously far out of range, or where connections were made but the data rate was just too slow to really use effectively. By adding ten times the normal RF power, the freedom to connect to longer distance wireless networks is a reality. Schools are delighted to be able to add iMacs at the far corners of buildings, without sacrificing signal strength or speed. At $200 , the iMac G5 Transceiver is available from QuickerTek dealers. This small QuickerTek iMac G5 Transceiver is not much larger than a antenna, clips temporarily onto the iMac case. It connects to the new AirPort card inside the iMac G5. It's ideal for full-speed connections at larger network areas such as college dorms and expansive offices, where users normally can't reliably connect and certainly not at any satisfying wireless speed. The QuickerTek iMac G5 Transceiver offers 500 milliwatts of RF power. By comparison, iMacs tend to have average RF power of little more than 30 milliwatts. The challenge is that iMac G5s have an internal metal shield that limits the effectiveness of the built-in AirPort wireless. It's easy to see why the QuickerTek iMac G5 Transceiver can not only connect to longer distance wireless networks, but also offer full-speed, very usable connections. It's also as simple to use as the iMac itself, with no extra steps required. Rick Estes, president of QuickerTek, Inc. stated, "Our growing Transceiver product line has been making longer distance wireless connections easier for mobile PowerBook and iBook users," Estes stated. This new Transceiver is ideal for those networks with longer distances between the iMac(s) and the network access point or AirPort Base Station. These distances severely limit the wireless connection speeds. Like most QuickerTek products, it's backed with a one-year warranty on parts and labor. QuickerTek has been a recognized leading innovator of antennas and RF products for Apple Power Macintosh, iMac and PowerBook computers. QuickerTek products can be purchased online. PR: It's the time of year when Santa is making his list and checking it twice - and this year he is packing plenty of the year's coolest tech devices on his sleigh. He knows that every computer programmer and übergeek will be hoping to unwrap a blank keyboard when they are opening presents in just a few short weeks. Metadot Corporation is urging all shoppers to consider Das Keyboard for the geeks on their holiday shopping list. Das Keyboard is an enhanced 104-key USB PC keyboard equipped with blank keys mounted on precision and individually weighted key switches. Since users cannot look at the keys while typing, their brains adapt and memorize the key positions, resulting in faster and more accurate typing. In addition to its unique appearance, Das Keyboard features five different levels of force required to activate its keys. Whereas most keyboards use a standard 55 grams of force to register each key, Das Keyboard's keys are divided into groups with feedback springs weighted differently, from 35 grams to 80 grams, which corresponds to the strength of the finger that touches the keys. The result is more comfort for the user's hands. Das Keyboard is built from premium keyswitch technology and its keys are factory-tested to withstand over 30 million keystrokes. "Give your geeks what they truly desire this holiday season," said Birgit Guermeur, project manager for Das Keyboard. "If you have someone on your list who is passionate about technology, whether they love to play games or write code, Das Keyboard is the perfect gift. Not only does the keyboard look really cool, but it can help enhance their productivity because it will teach them to stop looking down at their fingers while they are typing." Das Keyboard is compatible with all modern operating systems including Windows, Linux and MacOS X. Priced at $79.95, Das Keyboard is available now from the company's website or from ThinkGeek, Inc. at 888-433-5788. PR: Boenig & Kallenbach, the German specialist for Macintosh add-ons presents the new USB interface "Service USB Plus" enabling measurement and control of real-world devices from a wide variety of standard Macintosh applications. Service USB plus has been proven in professional implementations for industry, trade shows and entertainment. It can be used for example to drive special effects such as flashes or fog machines directly from Macromedia Director MX for concerts or trade shows. Further examples for using Service USB plus include complex measurement value logging with temperature, liquid, pressure or light sensors as well as remote control of slide projectors, relays, step motors, switches or push buttons. 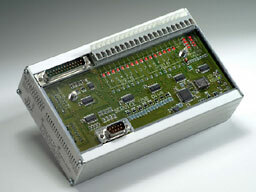 By combining multiple Service USB interfaces, up to 128 input and output channels can be handled by a single Apple Macintosh computer. With Service USB, real-world devices can be controlled directly from standard Macintosh applications and programming languages such as AppleScript, REALbasic, DirectorMX, 4th Dimension, FileMaker, Ragtime, MaxMSP, LabView, C, C++, Cocoa, Java, Carbon and the UNIX-Shell. Service USB ships with a complete SDK including drivers, sample applications and documentation. For connecting external devices, Service USB plus offers eight digital input, eight digital output and two analog input lines. The state of connections is displayed on 26 LEDs providing a visual control during operation. Service USB plus ships in a compact and robust aluminum case including 21 cable clamps for connecting control lines, a 25-pole standard connector replicating all signals and an RS232 interface for controlling additional devices. PR: One Finger Snap is a Preference Pane that brings up the contextual menu whenever you click and hold down the mouse button. This means that you can do everything with a single-button mouse that you can do with a 2-button mouse. Many new Mac buyers find that the first purchase they make is for a 2-button mouse so they can have quick access to the contextual menu. Sure, you can hold down the control key when you click, but let's face it, a two button mouse makes the contextual menu so much easier to get to. Now with One Finger Snap, you can just click and hold down that one button to get to the contextual menu. And that way you can hold onto that beautiful Apple mouse, too. At the office, you have a nice two-button mouse, and you use it every day. Now you take your PowerBook on the road, and your right mouse button finger is just twitching. You get things done so much faster with the contextual menu. Don't you wish there was an easy way to get to it from the track pad? One Finger Snap works as well with a one-button track pad as it does with a one-button mouse. So you can click and hold the trackpad button rather than carry along another piece of equipment. So you took the plunge and switched to the Mac. Good for you. While you like Mac OS X on your new Mac Mini, you can't help but miss that old 2-button mouse. Don't go back to Windows, just try One Finger Snap. It's much cheaper, and it has fewer viruses. One Finger Snap can still help you. Wouldn't it be nice to have just one more button? Turn on One Finger Snap, and you no longer need that right mouse button for the contextual menu. Now you can reassign it to something more useful (like launching your browser or opening AppKiDo or reading Joy of Tech). The click feedback sound volume is now adjustable.